This turbulent cosmic pinnacle lies within a tempestuous stellar nursery called the Carina Nebula, some 7500 light-years away in the southern constellation of Carina. Hubble's Wide Field Camera 3 observed the pillar on 1-2 February 2010. Full Story. The prolific Hubble Space Telescope will hit an importantmilestone this weekend ? the 20th anniversary of its launch. 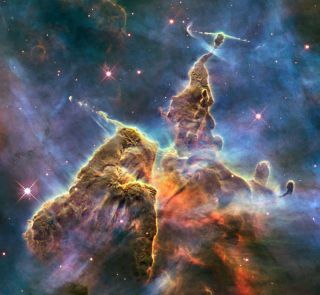 Hubble scientistsare celebrating the iconic space telescope's milestone with a stunning newphoto of pillar-like mountains of dust in a well-known nebula. The stunning Hubble photo shows just a small part of the CarinaNebula, one of the largest seen star-birth regions in our galaxy. It capturesthe top of a 3 light-year-tall pillar of gas and dust that is being eaten awayby the brilliant light from nearby bright stars. The pillar is also being pushed apart from within, as infantstars buried inside emit jets of gas that can be seen streaming from thetowering peaks. The Hubble SpaceTelescope launched on April 24, 1990, aboard the space shuttle Discoveryduring the STS-31 mission. Hubble's discoveries and evocative images were revolutionaryin a number of areas of astronomical research, ranging from planetary scienceto cosmology. "Hubble is undoubtedly one of the most recognized andsuccessful scientific projects in history," said Ed Weiler, associateadministrator for the Science Mission Directorate at NASA Headquarters inWashington. "Last year's space shuttle servicing mission left theobservatory operating at peak capacity, giving it a new beginning forscientific achievements that impact our society." To date, Hubble has observed over 30,000 celestial targetsand amassed more than a half-million pictures in its archive. The most recentastronaut servicing mission to Hubble in May 2009 made the telescope 100 timesmore powerful than twodecades ago when it was first launched.